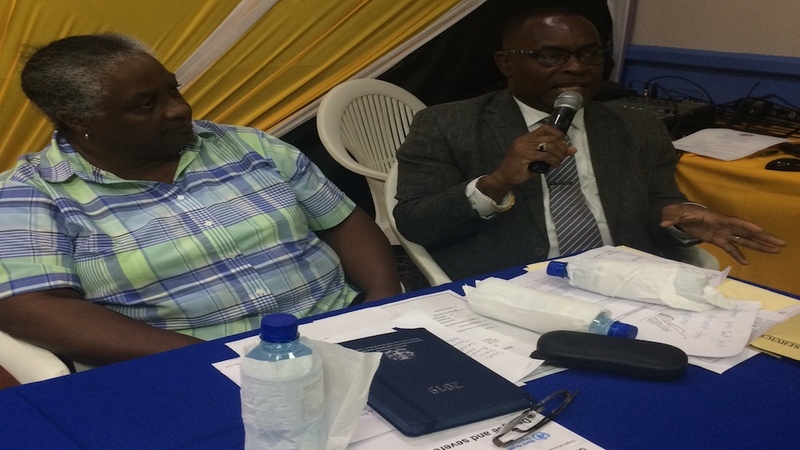 Portmore’s Mayor Leon Thomas addresses a dengue stakeholders meeting Thursday night at the Portmore Municipal Corporation’s Portmore Pines offices. Looking on is Chief Medical Officer for St Catherine, Dr Prosper Chen. The dengue outbreak which has the community of Portmore, St Catherine firmly in its grip, took on political overtones on Thursday night when the People’s National Party-dominated Portmore Municipal Corporation (PMC) rejected the $300,000 to $400,000 that has been allocated by the Ministry of Health to each councillor to combat the outbreak. News of the allocation, which will also see each Member of Parliament being given $800,000, was conveyed to the PMC by the chief entomologist in the Health Ministry, Sherine Huntley Jones. She was speaking at a stakeholders meeting called by the PMC to address the dengue outbreak in the municipality. The councillors, led by PMC chairman and mayor, Leon Thomas, took issue with the fact that they heard about the allocation second hand. They were also concerned that the amount was not enough to undertake work in the hardest hit communities, if it was divided up individually among the 12 councillors. Thomas had a message for Tufton which he asked Huntley Jones to convey on his, and the corporation’s behalf: “Don’t worry transfer $300,000 to this division, we don’t want it,” Thomas stated. 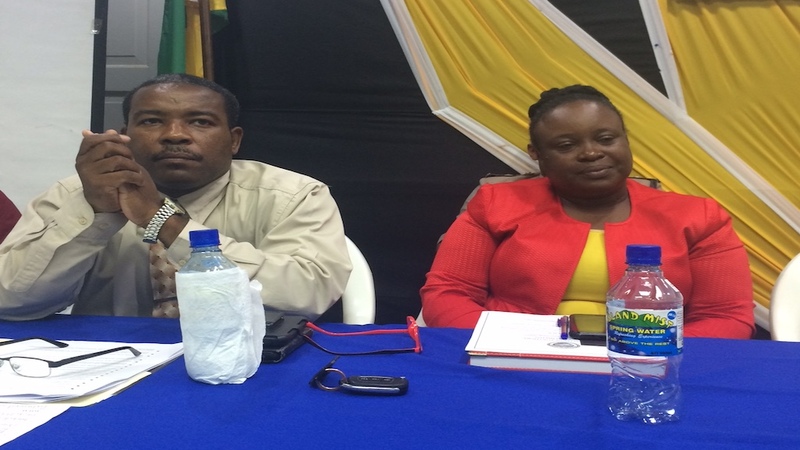 Chief public health inspector for St Catherine, Grayson Hutchinson (left) and chief entomologist in the ministry of health, Sherine Huntley Jones, at a dengue stakeholders meeting in Portmore on Thursday. “If there is any plan to allocate any money at all, we (already) have a plan. I have had discussions with the minister before on the phone and I told him about our plan. We have partnered with the local health department and also the National Solid Waste Management Authority. So if any money come at all or if there is any plan to send any money to the council it should come to the council, we look at the situation and we deal with it accordingly,” Thomas said. “When you give each councillor $300,000 or $400,000, that can only move three or four truckloads of bulky waste from the division and then you’re going to say that the councillors get money. We want to work with the plan and all 12 councillors in this municipality are a part of what we are doing here so we don’t want the money to (be) splintered,” Thomas added. The mayor was supported by Fenley Douglas, the councilor for the Waterford division, one of the worst affected in the municipality. Things got heated when Douglas took the floor and appeared to lambast Minister Tufton for his handling of the dengue outbreak. Councillor Douglas agreed with Thomas that the money should not be splintered. He then accused the health ministry of not being aware of the critically affected divisions in the PMC. “This JLP, PNP thing can’t work for us in Portmore,”Douglas said. “I’m saying this, without water in my mouth, that on behalf of the people of Waterford that elected me to be here, we don’t want the $300,000. What we are demanding is for the minister to leave his chair and have dialogue with the mayor of Portmore…and this parish council,” Douglas said to applause. However, there was some unease in the audience when he appeared to chastise the minister for politicising the outbreak. According to Douglas, Tufton stated on air that he had toured Portmore. But, Douglas noted that there are 110 communities in Portmore and, according to him, the health minister toured the lone JLP division that was impacted by the outbreak. But there was noticeable push back from audience members, including from the JLP councillor for the Gregory Park division, Joy Brown. Huntley Jones also defended the Minister in her capacity of a civil servant, forcing mayor Thomas to intervene and bring calm to the situation while appealing for the meeting not to become political. Meanwhile, Mayor Thomas, who had earlier addressed the meeting, lamented that he had received little or no support from the ministry of health in the dengue fight. He said the PMC has had to resort to “own source funds”, some $2 million of which has already been spent to, among other things, remove solid waste and to conduct bushing in affected communities. The PMC has also purchased mosquito nets and drum covers for water storage containers for distribution to residents. However, Thomas said the PMC was now in need of an additional $7.2 million to complete the programme. And he was also upset that both the ministries of health and education denied his request to delay the opening of schools in the municipality for two days at the start of the new school year to allow for the premises to be fogged. This, he said, would have prevented the current situation where some schools, including Portsmouth Primary, were seeing up to 10 students each day presenting dengue symptoms and having to be sent home.